Route on Strava: Furcia fun! The Furcia loop is a nice change from the classical Dolomite passes and – if you like steep gradients - this one’s for you! Starting in Badia, head north on the SP244 towards Brunico. In the town of Longega, turn right (south) in the direction of Al Plan de Mareo / San Vigilio. The road starts to climb gently. Turn left on a narrow road that takes you north again. This is a private road used by locals to get to the various homes on this hillside. In the worst-case scenario, you may meet 1 or 2 cars and a tractor – since the road is narrow, stay on the right side! After a short climb this road continues downhill towards the city of Brunico, passing through a beautiful forest and nice little hamlets. The first fresh water fountain to fill your bidons is on the right side. You’re coming to an intersection in the town of San Lorenzo / St. Lorenzo. Just continue straight on the road towards Riscone that starts to go uphill again until you reach the town of Santo Stefano / Stefansdorf. You’ll be going through the town of Riscone. Instead of following the main road, turn left on a side road that soon becomes a great cycling path that will take you directly to the town of Valdoaora where the Passo Furcia starts. This cycling path goes up&down constantly. When you reach the town of Valdaora di Sotto / Niederolang, follow the cycling path signs that say “Dobbiaco panoramica” … Make sure you take the ones with PANORAMICA written on them. You will also find another water fountain near the church. Make sure you fill your bidons here because the Furcia starts soon. Now you’re off the cycling path and back on the main road. 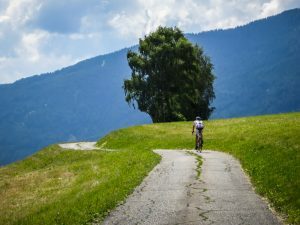 Take this road and you’ll reach the little town of Gassl where the climb of the Passo Furcia begins. Read the description of the Passo Furcia at the following link. There’s another water fountain here in case you didn’t fill your bidons in the town of Valdaora. 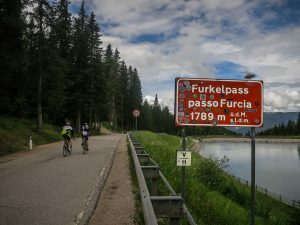 Passo Furcia KOM! You’re at the top! Take some pictures (and maybe share them with us). A nice downhill starts now towards the town of Al Plan de Mareo / San Vigilio di Marebbe. Make sure your breaks don’t heat up on the descent. You’ve reached the town of Al Plan de Mareo / San Vigilio di Marebbe. Turn right following the signs for Brunico that will take you to the town of Longega. If you need to fill your bidons, then – instead of turning right – go straight to the main square in front of the church where you’ll find a water fountain. Once you’ve reached the town of Longega turn left towards Badia / Corvara. From here the road gently climbs for 15.3 km until your’re back to the starting point in Badia.